With the MA Summer shows coming up on the 3 – 9 September, we caught up with MA Textile Design student Amy Green to find out a little more about her practice. Amy uses a combination of wood block printing and screen printing to create her wallpaper designs. What are you currently working on in the Workshops and what specialist facilities are you using? I am currently working on my final collection of hand block printed wallpapers made from recycled paper and sustainably sourced natural pigments. 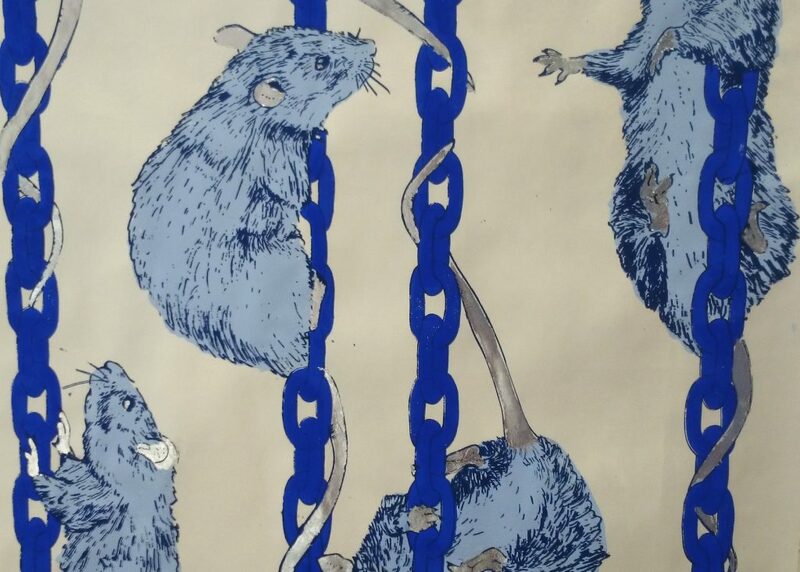 The wallpaper depicts animals that are particularly vulnerable to poisoning by toxins released into water by traditional methods used in dye-houses and printing studios. The pigments I have chosen are non-toxic mineral based powders that I mix with water and a natural binder like gum arabic to make the printing inks. I have used the wood workshop to cut the wooden blocks for the prints and to source the reclaimed waste wood from which they are made. Though mostly I have been working in the print studio using the long tables to lay out my lengths of wallpaper some of the fine detail has been printed using the screen printing facilities, including the exposure unit and all the tools needed for this process. 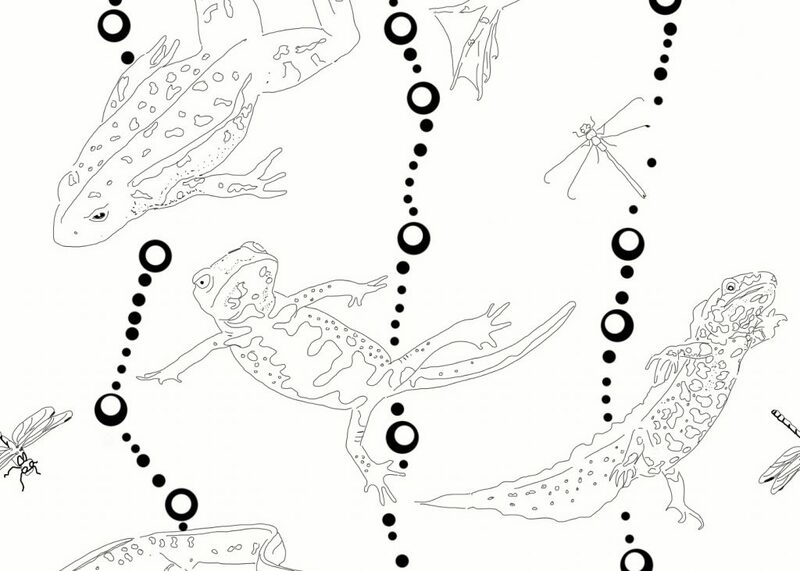 The wallpaper is produced using a combination of different techniques. 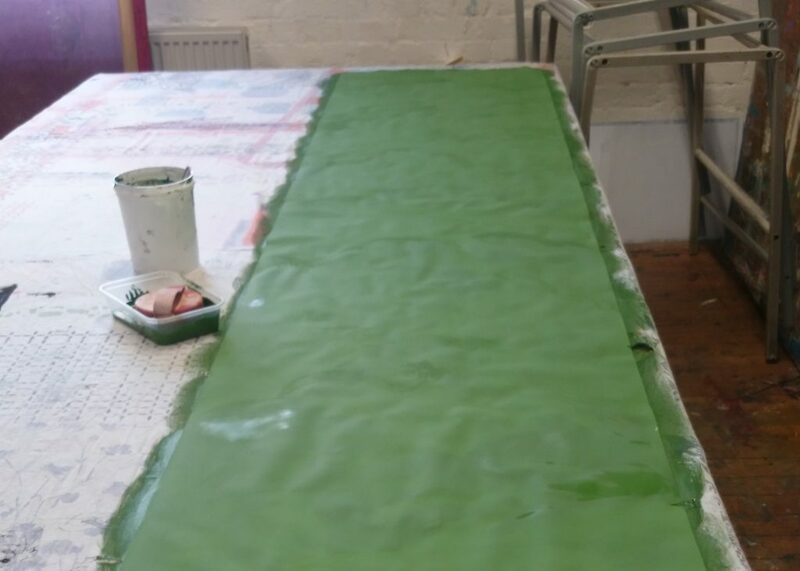 The first is to use a special rounded brush to hand grind the pigment into the surface of the wallpaper; this acts as the base colour, or “ground” for the detail of the wallpaper to sit on top of, depending on the colour it may need as many as three coats. Next I use a screen to very faintly apply the key line to the paper to act as a guide for placing the blocks this will make sure that I can achieve an accurate repeat as I move up the paper. I then apply the appropriate pigment to the wooden blocks working in layers from the background of the images to the foreground the layering print helps achieve a texture and depth to the image. It is important to plan the layers at the design stage as it is often difficult to print light colour over dark, this means that you have to print the light colours first working forward to the darkest shades. Finally I reapply the key line putting on the fine detail and pulling the image together. 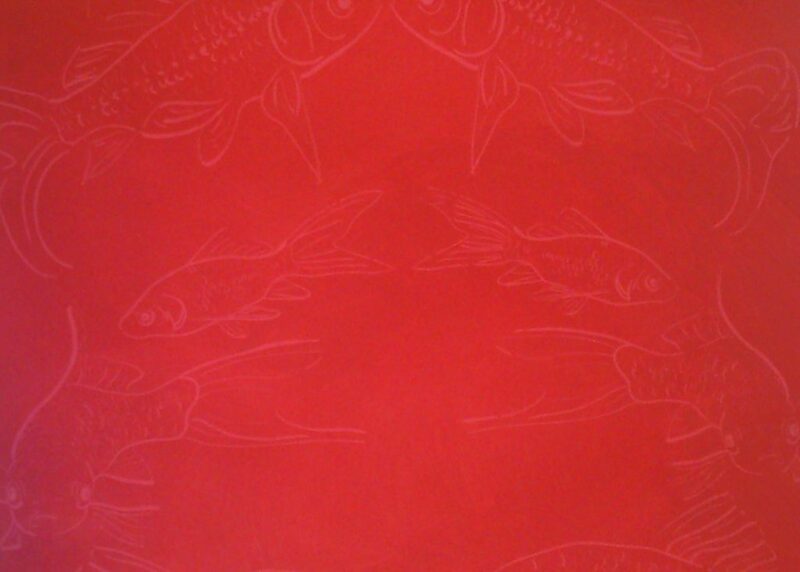 The design will have between five and 10 layers of printed pigment giving the work lots of wait, depth and texture. Some designs have the addition of gold leaf or hand dyed flock applied to add an extra finish. Over the past year I have worked with a number of the technicians across the wood, stitch and print studios. Specialising in print I have had most contact with the technicians in the print studio, they have all been really helpful and supportive with advice, and ask questions that help you make your own way. Harriet (Textile Technician) particularly is there every day advising with technical issues and helping you find the best practice for you. I couldn’t have done it without them. 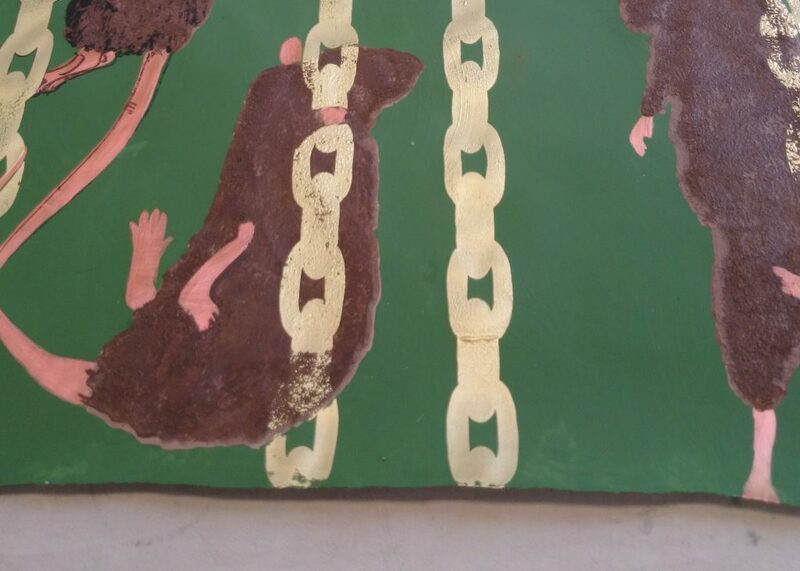 This is an example of the 70s style rat wallpaper. All of my wallpapers are in colour combinations inspired by a design period or style from history. I have Edwardian greens, willow pattern blues, oriental reds with gold and 70s psychedelic. I think the biggest technical challenge I have faced was making a natural pigment printing ink that could be used for both block printing and screen printing. 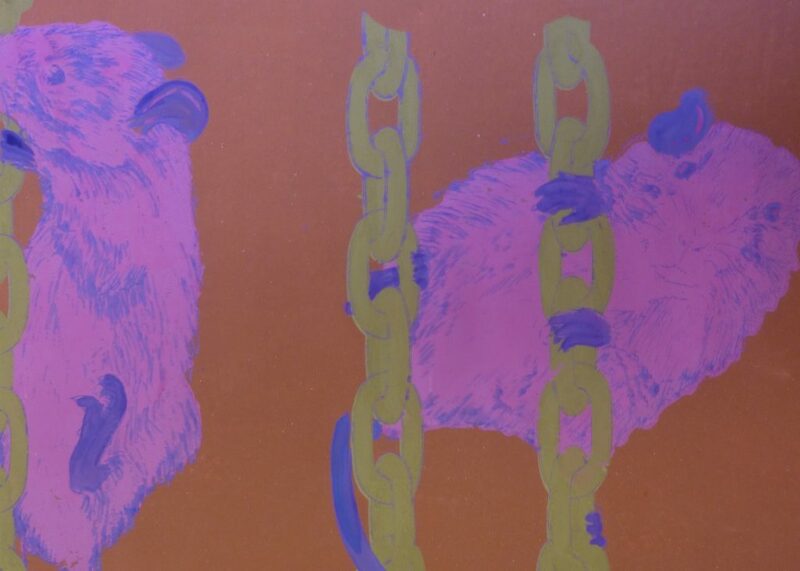 In general the two inks are not at all alike, block printing ink tends to be viscous and applied more thickly to the paper, while screen printing ink tends to be more fluid and applied more thinly. It was hard to find a pigment that had enough colour opacity with small enough particles to pass through the screen, and not be too dark or powdery when applied thickly to a block. I also had to make a binder and medium that would work in both situations without compromising the integrity of the natural ingredients. It took a lot of experimentation to strike the right balance, and this required extensive research adapting existing printing techniques to make the process a success. You can find out more about Amy’s work via her Instagram account. And you will be able to see her designs during the MA Summer Show. Find out more about MA Textile Design as here.